Changes in hormones cause some women to become diabetic during pregnancy even though they never suffered from the condition before. Researchers don't know the reason for the onset of what is called gestational diabetes, but guess it's an unfortunate consequence of the rush of hormones needed to promote the baby's development. Unable to properly use insulin, which helps sugar enter the cells where it is converted to energy, glucose builds up in the blood leading to hyperglycemia. 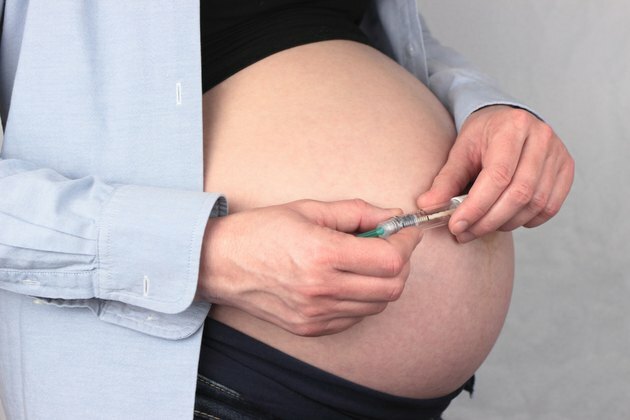 The mother must inject more insulin into her body to metabolize the excess glucose, which could lead to too little sugar in the blood, or hypoglycemia.